This is what’s called a Sketchnote. A Sketchnote is a graphical way of taking notes or illustrating learning. Doing a skechnote on material learned makes the learner process the information in a deeper way than just reading, hearing a lecture, or writing notes. I had a terrible time with this Sketchnote. #1 I can’t draw. #2 I really can’t draw on my computer with a mouse or on an iPad with my finger. I tried. I downloaded three different programs and none of them helped my bad drawing. Seriously, I couldn’t even spell a couple words and have them readable. I know I can draw text and images on my Smart Board at school, so I drove to work and did this on my Smart Board. I drew it in Photoshop using my Smart Board. The part under the title explains the Principle. Words and graphics are always better than just text or just graphics. This is a “no duh” kind of principle on the surface, of course text and graphics together has to be better than each one alone! But all good principles state the obvious in a way that can then be extended in a more meaningful way. That brings us to clip art and other decorative graphics. They don’t count. To improve learning, the graphics and text should both support the idea being learned. 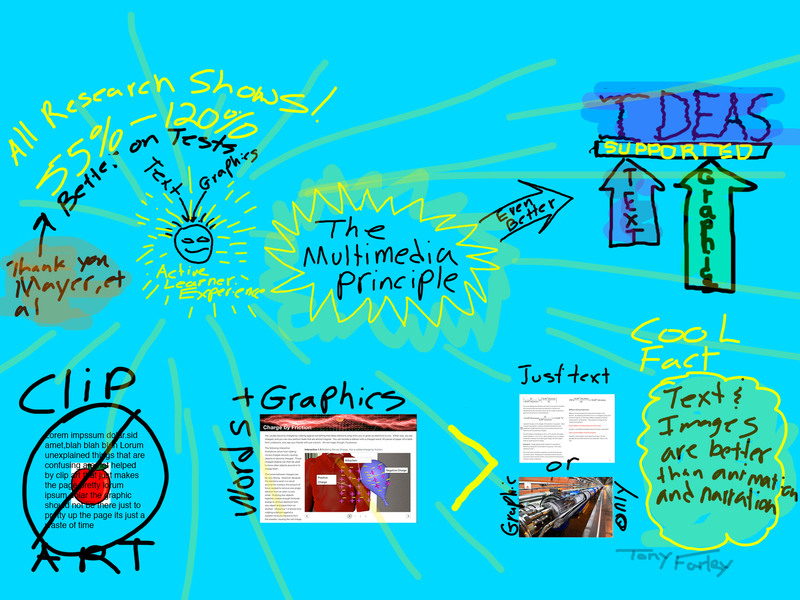 The top right of the Sketchnote shows that in a very Multimedia Principley way. The top left shows the research. All research shows that learning is increased when text is combined with graphics in a meaningful illustrative way. This happens because the minds combining of images and graphics creates an active learning experience. My picture shows a kid with text and graphics entering his head and the active learning experience resulting in his head lighting up like a lightbulb. The last part on the bottom right shows a cool fact, that text and graphics is better than animation and voice narration. This is because when a learner views animation and narration, they are not actively processing the information, they are absorbing information passively.